Perusing a chart on the allegations leveled by residents of 17 children homes in Bihar and how they were dealt with by the local police, the Supreme Court bench headed by Justice Madan B. Lokur on Tuesday expressed that they would like the CBI to take over the investigation, requiring the CBI's Counsel to seek instructions from the agency. “The police is not doing its job as expected”, recorded the bench, also comprising Justices Abdul Nazeer and Deepak Gupta. “Sir, what are you doing? This is very shameful! A child is being sodomised and you say that nothing has happened? How can you do this? This is inhuman!”, directed Justice Lokur to the counsel for the state of Bihar. When the Advocate sought to submit that the POCSO Act is already being taken recourse to, Mr. Naphade objected citing the difference in the quantum of punishment. Amicus Curiae Aparna Bhat added that even under the POCSO, the cases are not being registered for the aggravated forms of assault. “We are not on POCSO but section 377. Is section 377 worth investigating here or not?”, inquired Justice Lokur. “You can either say that there has been a mistake and lodge the FIR in respect of the relevant offences or you can argue and wait for our order. If we come to the conclusion that there has been a violation of section 377, you will be bound to register the case”, continued the judge. The state counsel undertook to ensure that section 377 and the other appropriate provisions are added. “We were told that you shall look into matter with great seriousness. Is this your seriousness? This report was given to your government in May and you are saying you have only seen it today? That is the tragedy! You are appearing for the state and not for yourself! Just because you claim to have seen this today, the government cannot be absolved!”, observed Justice Lokur. “When a charge of sexual violence has been levelled, it could either be aggravated or minor in nature, but how can the police say that it is not aggravated while recording the FIR? If the offence is not included in the FIR, how will you investigate? The Normal tendency of the police is to incorporate the more serious offence in the FIR and here, you are doing the opposite despite the report clearly indicating otherwise? And this in-spite of the history of this case? Every time we read this file, it is tragic!”, bemoaned Justice Gupta. Assuring that he shall himself see that due rectification of any lapses that may have occurred is affected, the advocate for the government of Bihar sought time until Monday. “Why? When you have the information that a crime has been committed, can you say that the FIR will be lodged after a week? Would the accused then not argue that since there has been grave delay in the registration of the case, the whole thing is a cooked-up plot? We want an affidavit from the Chief Secretary that the rectification shall be carried out today! You have 24 hours! We will take this up tomorrow at 2 PM. Let the Chief Secretary also be present so he knows what is happening in his state!”, Justice Lokur ventured at the initial stage of the hearing. “I will make the rectifications within 24 hours but please put up the matter for Monday”, persisted the advocate for the respondent state. “You do so! then we will adjourn it tomorrow!...what are you saying, sir? please look at what has happened! a child is sodomised and you want to lodge the FIR on Monday? The Facts are all available!”, Justice Lokur pulled up the state. Examining the affidavit on behalf of the Chief Secretary, Justice Gupta noted that 17 children homes have been identified as being of “grave concern”. “You have pinpointed 17 homes as a matter of ‘grave concern’. What do you, the state, regard as ‘grave concern’?”, the judge wanted to know. That there may be violations of other kinds and not necessarily physical offences, replied the state counsel obscurely. “In another instance, there has been a gash on the cheek of a child, a three-inch long scar and there has been no (section 325 of the IPC)? And why the gash? Because the child refused to cook!....a girl committed suicide. The report shows severe physical abuse. But there is no investigation into the unnatural death?....”, weighed in Justice Gupta. “Another girl lost her mental balance because she was not allowed to speak to her parents!”, continued Justice Lokur. The advocate for the Bihar government asserted that there has been no motive or malice on the part of the state in dealing out differential treatment to these cases. “Based on the report of May this year, all institutions are being brought under one roof. The State is not sitting over it. steps are being taken even though they may not meet Your Lordships’ standards....the NCPCR is already undertaking the audit and its report will reveal whether the requisite measures have been adopted or not....”, he insisted. “We are expecting only the standards of a reasonable person. if you do not meet them, then we do not know what standards you have!”, countered Justice Lokur. “Out of the 17 institutions to which ‘grave concern’ has been attached, FIRs have been lodged only for 10. You have to investigate all this. We do not know what may come out, but The consensus is that there is more than what meets the eye. 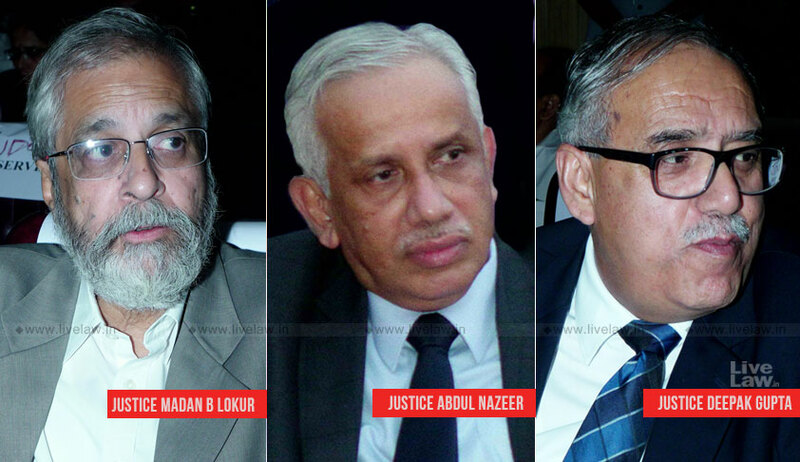 Let the CBI do it....”, concluded Justice Lokur. “We do not know what you can do. Subject to what he (the SPP) says, we will hand over the cases to the CBI....”, said Justice Lokur resignedly, When the advocate for Bihar asked if the state should act over the FIRs.